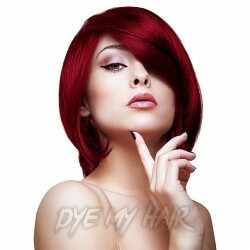 Burgundy Hair Dye There are 11 products. Make you hair look beautifully scarlet red by adding the Herman's Amazing Semi-Permanent Hair Colour 115ml in Scarlett Rogue Red to your hair. Vamp up your look with the glorious Manic Panic Amplified Semi-Permanent Hair Dye in Vampire Red! Sink your fangs into this tasty blood red shade of Manic Panic High Voltage Classic Cream Formula Colour Hair Dye in Vampire's Kiss! Get a suave new appearance with the Crazy Color Semi-Permanent Hair Dye 4 Pack 100ml in Bordeaux Red! If you want a hair colour that'll blow people's socks off, check out the Crazy Color Semi-Permanent Hair Dye 4 Pack in Cyclamen. The perfect balance of edgy color and natural gorgeousness, burgundy hair dye is a great choice for anyone seeking a deep, dark and daring hair color. A perennially fashionable and feminine color choice, this deep red shade is bound to get you noticed. 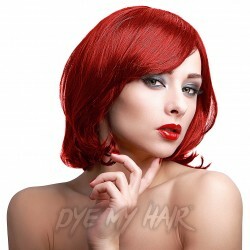 So why not check out our full range of burgundy hair dye and get the bold new look of your dreams? From Cheryl Cole and Amy Childs to Ariana Grande and Demi Lovato, burgundy hair has been captivating the locks of glamour queens, edgy chicks and fashion fans for decades. With deep hues of maroon, plum and wine favored by dyehards in the know, burgundy and red hair color has become a staple in the beauty world. With an intensity and depth that you just can’t find a lighter hair dye, it’s no wonder that it’s one of the best-selling shades we sell! Whether you opt for a solid wash of color, a burgundy ombre effect or a natural balayage burgundy highlights finish, this rich and sumptuous hair color is guaranteed to turn heads. A particularly popular choice for dark-haired divas, burgundy hair color tends to be so intense and vibrant that pre-lightening isn’t always necessary! Great for adding depth and dimension, you’ll always be able to find burgundy hair dye for dark hair when you shop with us. 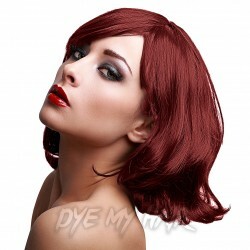 No matter what your complexion, this dark red hair shade is sure to suit you. One of the most universally flattering hair dye shades on the market, whether you’re looking for burgundy hair dye to suit your fair skin or dark skin, you can guarantee to find your ideal match here at Dye My Hair. With so many amazing semi permanent hair dyes to choose from, you’ll be completely spoiled for choice! Burgundy Hair Color: Perfect For All Ages! ALWAYS read the instructions! This may sound glaringly obvious, but you’d be amazed at how many people forget to do this and end up applying the dye incorrectly or get the development time wrong. Even if you’ve used the brand before, we recommend reading the instructions and following them to the letter to avoid mishaps. Don’t forget, you’re aiming for the burgundy hair color of your dreams, not the shade of your nightmares! NEVER forego proper preparation! If your hair isn’t in great condition, then dyeing it probably isn’t the best of ideas. Delay the coloring process for a week or two so that you’ve got time to go for a trim and intensively condition your locks. Believe us, this will make all the difference! ALWAYS make sure you’ve got enough hair color to completely saturate and cover your locks. If you don’t have enough, you’re likely to end up with a streaky or patchy dye job and nobody’s aiming for that! If you’re on the fence about how much burgundy red hair dye you’ll need, pick up an extra package of dye to safeguard yourself. If you don’t use it, then at least you’ve got more ready for the next time you color your hair! Now if you’ve read this we’re pretty sure you’re well onto your way to getting your burgundy red hair dye transformation, but don’t go anywhere without some of Dye My Hair’s top hairstyle ideas for this fabulous color. 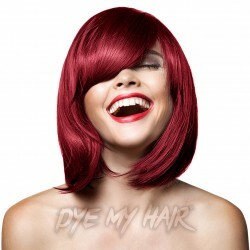 If you’re thinking of grabbing yourself some Crazy Color Semi-Permanent Hair Dye in Burgundy then you can obviously indulge your whole scalp and give yourself an irresistible look. However, if you’re looking to try something a little more daring you can always get some burgundy hair ombre and fade this lavish color in with your natural hair shade! But if you’re looking for something a little more natural but have a dire need for something flashy then look no further than treating yourself to some fresh burgundy highlights! Not only will this look give you a subtle and captivating new style, but it is also incredibly affordable and easy to do in your home! Simply grab yourself one of our Deluxe Tint brushes or accessory sets, delicately run the dye through your hair and get ready to recreate salon professional hair at the tip of your fingers! So there you have it! The top guide on how to get yourself an amazing burgundy hair dye experience from start to finish! Have you got your next hair-do fully planned? Need to get planning your next one? 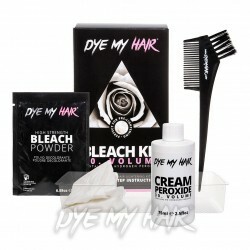 If so make sure to head yourself over to the Dye My Hair website for the latest advice and best hair dye colors and products available!